Let us have a Short cake recipe for today. 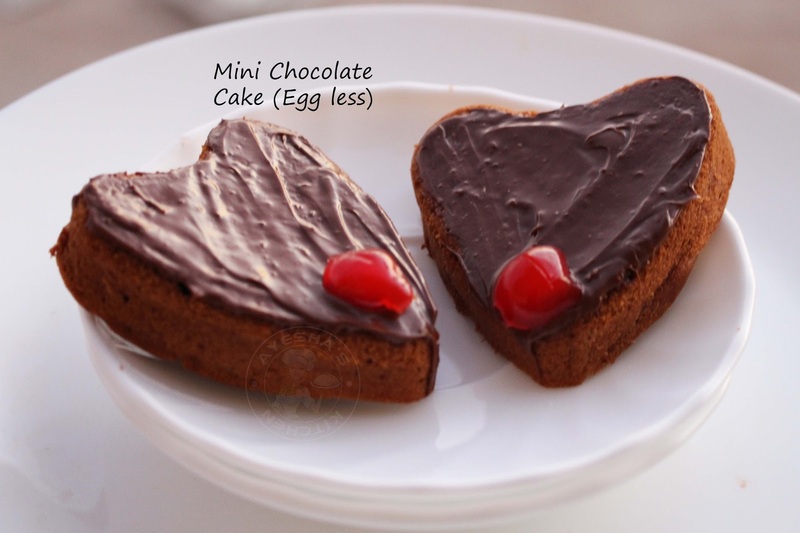 This heart shaped shortcake is an Egg less recipe, a perfect eggless Chocolate shortcake which is super moist. A yummy chocolate cake recipe which is all about chocolate. Shortcakes are typically made with flour, sugar, baking soda or baking powder, butter, milk or cream and sometimes eggs. Thus prepared batter is then dropped in spoon in a mini cake moulds and then baked until done. The most famous and common shortcake dessert is strawbery shortcake. Here i just made an eggless chocolate shortcake recipe which is heart shaped. This dessert is perfect for a party dessert ideas especially for kids party . Nutella and chocolate is all time favorite for kids. They just love such chocolate desserts to the core and so do try this simple lovely attractive chocolate cake recipe for your loved ones. Such dessert recipes or cake recipes are mostly demanded for valentines day and on festive days like Christmas, Id, Diwali and like so. 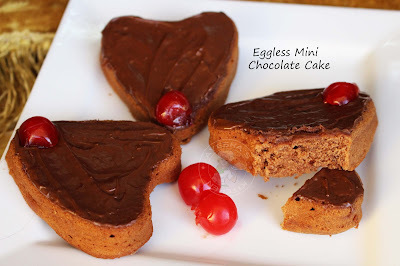 Here is the recipe showing how to make eggless short cake recipe /eggless chocolate cake recipe /eggless cake recipe / recipe for eggless cake /eggless dessert recipes/ christmas dessert ideas / valentines day ideas. Preheat the oven for 5 minutes at 180 degree C. Grease the baking pan (heart shape muffin pan) and dust with flour. Tap out the excess flour and set aside. Sieve together the All purpose flour, cocoa powder, salt, baking soda and baking powder. Set aside. Add in condensed milk and butter in a large bowl. Make sure that the butter is at room temperature. Beat them well in the same direction until it turns smooth and airy. Fold the sieved flour to this and gently mix without disturbing the air bubbles. Add in vinegar, vanilla essence . Then add, warm milk little by little and mix gently until smooth dropping consistency. Add more milk if the batter is more thick. But do not add more. Scoop two table spoon of this batter in the mini heart shaped mold. 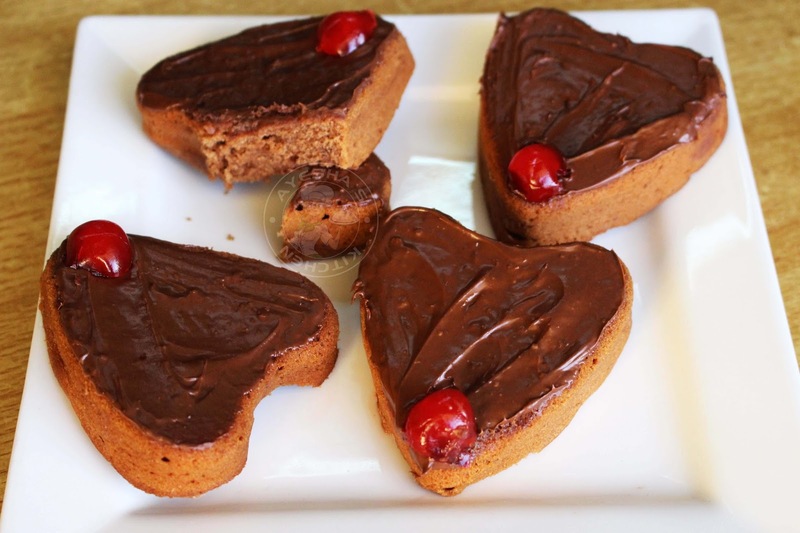 You can make 10 - 12 mini heart chocolate cakes with this batter. Bake at 180 degree C for about 20 - 25 minutes. Check after 15 minutes with a tooth pick. If it comes out clean, then it is done. Let it cool completely and then take out of the mould. Here i frost the cake with simple nutella or hazel nut spread only. Once the mini cake / shortcake is cooled well, spread nutella or hazel nut spread on the top. It tastes yummy and simple, right?